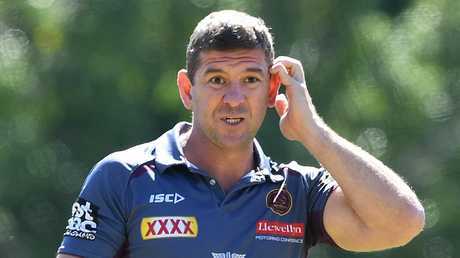 Broncos assistant coach Jason Demetriou (left) has been backed to take over from Wayne Bennett. 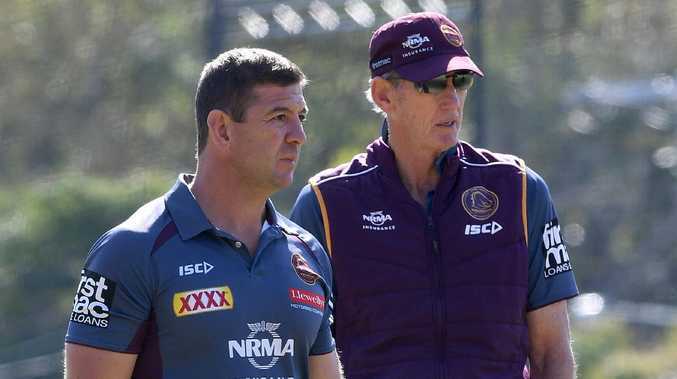 BRISBANE forward Josh McGuire has backed Jason Demetriou to step up to a head NRL coaching role but insists the Broncos can't lose regardless of who replaces Wayne Bennett. Bennett's future forms a key part in the coaching merry-go-round, with the long-time Broncos mentor told he won't be at the club in 2020 and rumours circulating he'll be at Wests Tigers as early as next year. The 68-year-old wouldn't go into his future on Tuesday when quizzed while coaching England but it's now believed the Broncos are ready to begin the interview process to find his successor. That list of candidates is expected to include Demetriou, New Zealand coach Michael Maguire, Queensland State of Origin mentor Kevin Walters and South Sydney's Anthony Seibold, who is contracted to the Rabbitohs until the end of next year. McGuire has worked with Demetriou, Walters and Seibold in separate capacities and believes any of the trio would be ideal to take over from Bennett in either 2019 or 2020. He has a special level of respect for Demetriou, who joined the Broncos at the end of 2016 after winning Queensland and NSW Cup titles in the two years previous. Broncos assistant coach Jason Demetriou. "Jason's a tremendous coach and very much capable of being a head coach anywhere," McGuire said in Kangaroos camp in Auckland. "He's won everything there is to win in the lower grades and I think he has been unlucky not to get a head gig yet. "I would love to be under him. I would love to have an opportunity to have him as my NRL coach. "I've worked with a lot of good football minds and he's up there with the best." Demetriou has also been linked with the Manly job in recent weeks but that now appears all but certain to be given to Des Hasler. Meanwhile, McGuire has played under Walters at State of Origin level, where Seibold was an assistant last year before securing the Rabbitohs' top job. "Kevvie has proved it in the Origin arena, he's coached in Catalans and in the Origin arena under Bellamy," McGuire said. "He's done his apprenticeship and is ready to go. "I've had Anthony as well at Queensland. I'm very fortunate enough to have worked with a lot of coaches at the moment. "It's a hard decision for our club, they have to make a decision soon but I'm sure they'll make the right one."